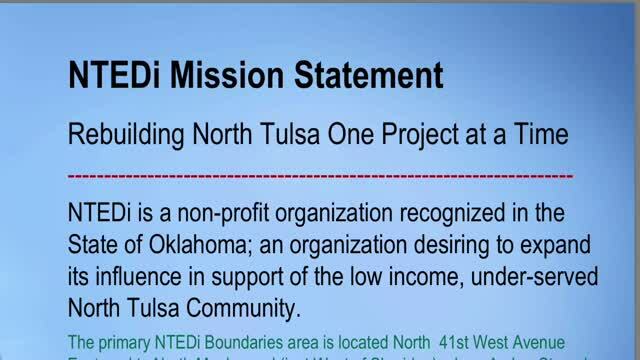 The North Tulsa Economic Development Initiative, Inc. (NTEDi) is a non-profit 501(c) (3) organization, organized to provide leadership for north Tulsa community based economic development endeavors, (i.e. social enterprises) and to improve the well-being and quality of life for people in low resource communities. The initiatives adopted annually reflect the importance of tolerance and inclusion and serves as a model for our state. NTEDi efforts are focused on supporting initiatives related to economic development, education, workforce, housing and effectively marketing the positive attributes in north Tulsa. The majority of NTEDi efforts are carried out through community engagement and partnerships with other agencies. Meetings are held monthly and the community is invited to attend. The continued volunteerism and support by NTEDi members and others is invaluable and supports NTEDi’s continued ability to provide needed voices and services to the north Tulsa community. Through the outstanding leadership of the Chair, Subcommittee Chairs and NTEDi Members we are able to impact the community of north Tulsa in a positive way. NTEDi members provide a continuous source of vision, inspiration, innovation and constructive influence for the good of the entire north Tulsa community and City of Tulsa. The desire is that north Tulsa be recognized as a premier destination point in the City of Tulsa. NTEDi members nurtured an idea conceived more than 12 years ago by former Mayor Kathy Taylor and citizens in north Tulsa who saw it beneficial to pursue works collectively to improve Retail/Business Development, Workforce Development, Housing/Homeownership Initiatives, Education, and Marketing efforts in north Tulsa. The desire is that north Tulsa is recognized as a premier destination point in the City of Tulsa. Some or current work and involvement is focused on the City of Tulsa 36th Street North Corridor Area Plan; attracting Local Community Investment in north Tulsa; Affordable Care Act Promotion; Support for Aging Community; NTEDi Education Retreat/Symposium; Job Creation and Retention; and Housing Summit. The list above is not all inclusive, but represents initiatives and projects that are currently underway. NTEDi continues to represent the community of north Tulsa and Tulsa very well and it remains critical that we continue to do the work necessary, working collectively with our community partners. NTEDi serves as a pathway to revitalization and business/retail development efforts for current and future residents of Tulsa. The renaissance in North Tulsa is amazing! The strong collaborative effort between the public and private sectors, along with the commitment to the area by all Tulsa citizens, has been the force behind this change. Tulsa’s leadership and citizens have worked together to build a bright future for North Tulsa while preserving its heritage and unique assets. The initiative reflects the importance of tolerance and inclusion and serves as a model for our region. The growth of new business in the area has provided a wide variety of quality jobs for local residents. These businesses are the outcome of a progressive strategy designed to support the attraction of new businesses and the growth of local entrepreneurial ventures. They have had access to creative funding opportunities, special training programs and other incentives that have ensured their success while supporting the employment of North Tulsa residents. The growing economy is apparent in the numerous retail and entertainment centers strategically located throughout the region. There are new neighborhood grocery stores and shopping areas, as well as, a hotel and shopping complex that offers national franchises with a wide variety of restaurants. These new ventures not only serve the needs of residents in the area, but attract “shoppers” from throughout the region. Home ownership has skyrocketed as new initiatives have made it possible for more residents to make the move from renter to homeowner. With this has come an increased pride in maintaining the beauty and safety of the neighborhoods. The neighborhoods reflect the sense of community that has grown from the peace of mind the residents enjoy knowing that their children are safe and thriving. They have great parks to play in, new recreation centers to enjoy, and safe sidewalks to ride their bikes. The schools are some of the best in the nation with a wide variety of learning opportunities for students of all ages. Along with the growing economy has come access to quality healthcare for all of the residents. The overall physical and mental health of the residents reflects the success of the many programs in the schools and the community health centers that have focused on prevention and wellness. Another sign of the success of North Tulsa is the new and improved public transportation system. It provides a variety of options allowing for easy access to and from jobs, shopping, schools and healthcare for residents and visitors of all ages. The bottom line is that North Tulsa is a great investment! People want to raise their families here and businesses want to build their futures here. With the efforts to leverage the natural resources for the enjoyment of residents and visitors, North Tulsa has truly become a destination spot! Sharing the assets and attributes of the north Tulsa community and adding greater value to the City of Tulsa. Primary target area is located North 41st West Avenue Eastward to North Maplewood (Just West of Sheridan), along Archer Street and Northward to 56ths Street North. NTEDi has been instrumental in the advancement of proposals to enhance the City’s efforts to stimulate economic development in North Tulsa, specifically; Peoria Connection Vision Tulsa and the 36th North Corridor Plan. The Peoria Connection ($7M) economic development plan was submitted by NTEDi and included in the Vision Tulsa plan, which voters approved April 5, 2017. NTEDi members served on the City of Tulsa Citizens Advisory Committee, providing assistance to the development of the 36th North Corridor Area Plan and resulting in the adoption of the 36th North Tulsa Small Area Plan by City Council. The 36th North Small Area Plan was supported by the community of North Tulsa and the North Star Neighborhood Association. NTEDi advocated for the completion of the Shoppes on Peoria project, in cooperation with the Tulsa Economic Development Corporation (TEDC). This latter agency received funding from CDBG through the City of Tulsa for construction of a retail building that served as the incubator facility for a number of participants of the Franchise Opportunities Reinforced with Assistance Rewards Development (FORWARD) program; FORWARD also received CDBG funding to support efforts. NTEDi members provided a continuous source of vision, inspiration, innovation and constructive influence for the good of the entire North Tulsa community and City of Tulsa.